Unlike Milan, Rome is often the focal point of any trip to Italy and arguably the city most portrayed in media as the quintessential representation of the country. Venice may be a close second. Other than history, though, Rome represents less of practical importance to the country against global political, commercial, and financial markets. Milan is home to the country’s stock market, its major GDP contributors (Fiat, Ferrero, Unicredit, the entire fashion industry), and in the minds of most entrants to the city, both domestic and foreign, the younger but more serious brother to Rome’s good looks, flamboyance, and chaos. Despite this distinction, Rome will forever be more popular. Why? Because it has better weather. It’s trees are more majestic. It’s nighttime street lamps are yellow—more romantic. And its residents are more outgoing and friendly. Charm plays a huge role in the love for Rome. Of course, there are also innumerable tourists flooding the city each year from abroad, many from Anglo countries like the U.S., Canada, and Great Britain. You’ll only notice obvious visitors to Milan around the Duomo and at a few of the main attractions, like the Castello or Cimitero Monumentale. In Rome, they are everywhere. Crowding buses, fanning their flushed faces, and fumbling with cameras. Like in Manhattan, they are ubiquitous, unglamorous, lack poise, and move slooowly. If you can overlook this, Rome is pretty fantastic and one still feels very Italian there. It was 17 years since I was there as a kid with my parents, and strangely enough, it felt the same. A city of oranges, yellows, greens, and browns, it is especially striking when the sun shines and dawn/dusk lighting hits all the right angles. At night, the yellow streetlights color everything in La Dolce Vita filter. In Milan, they are bright white, which suggests sterility more than romance. Inexplicably, Rome struck me as a curious hybrid of New York and New Orleans. The former for its vitality and nearly 24-hour attitude, and the latter for its lengthy history paired with charming disrepair. It’s not that Rome has experienced terrible natural disasters or lacks a tax base, but its physical mass and infrastructure have been hard to maintain properly against the wear of tourists, documented political corruption, and streets clogged with over a million Romans in Fiat Cinquecentos. In sum, these factors create an exhilarating urban setting that is beautiful and tiring all at once. My trip was planned around a series of appointments to visit luxury brands in the city. 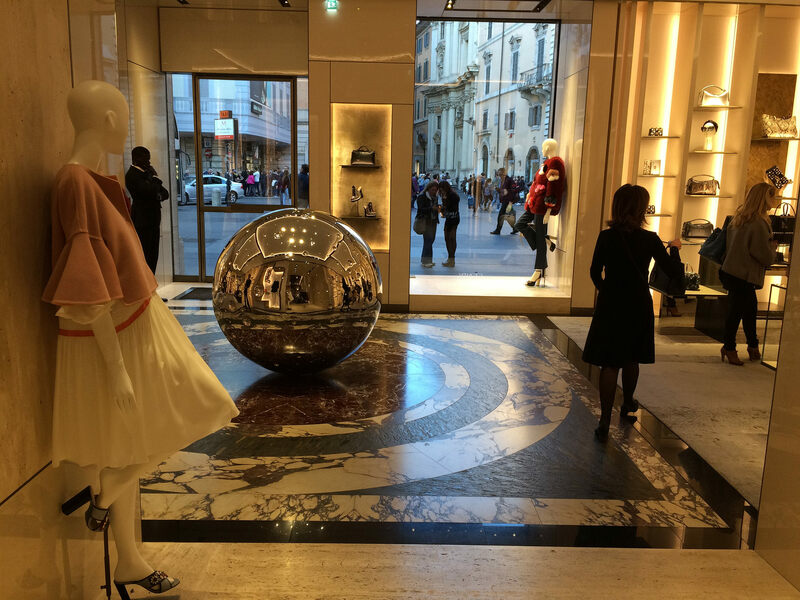 Fendi and Bvlgari were open as part of LVMH’s Les Journées Particulières, a sort of an open house for the conglomerate’s various brands throughout Europe, for that weekend only. I visited Fendi’s headquarters in Palazzo della Civiltà Italiana, 40 minutes south of the city by metro. The building is a Fascist skyscraper, categorized as such both by yesterday’s and today’s standards, made entirely of fantastic off-white travertine marble, typical of that era. It is commonly known as “the square Coliseum,” and though some may disagree, it is an architectural gem that rivals many of the more classical spots in Rome. It’s stature is enhanced by its detachment from the city’s core, as well as surrounding gardens, wide streets, and quiet government offices. The day I was there, a group of road bicyclists passed me and the birds chirped in Parco del Ninfeo. Inside Fendi headquarters, our tour snaked through the basement workshop, where artisans manipulate all manner of animal fur into coats, vests, accessories like stoles and keychains, and as trimming on shoes and handbags. I don’t love the idea of wearing a rabbit (or multiple) to be warm, but the craftsmanship on display was fascinating. Back in Via Condotti, I stood in the same spot where Elizabeth Taylor and Richard Burton did 40 years before, outside Bvlgari’s historic boutique. Inside, my group heard (in Italian) a history of the Roman brand, sat in the private salon named for Ms. Taylor, and viewed the store’s most noteworthy creations, many using colored diamonds and gemstones in motifs like the Serpenti. We also were able to watch a Bvlgari watch technician work on intricate movements, using a magnified image on a big screen. The Octo ultra thin men’s watch, unveiled recently. Very handsome. Through our connections in the SDA Bocconi Luxury & Arts Club, two additional boutique visits were arranged ahead of time: at Amouage and Editions de Parfum Frederic Malle, both niche perfumeries. I will write separately about these experiences. In between appointments, I clinked glasses with Dan Chiba, a Bocconi alum and former Fendi intern, at Fendi’s massive boutique in the center of Rome. It is one of the few brands that Rome is famous for, and their flagship store is not to be missed if you are a fan of fashion, architecture, or both. Otherwise, away from the polished surfaces, meticulous lighting, and insane price tags, my trip concluded with a unique visit to the Roman ruins. Dan arranged for us to join a tour at 11:15 p.m., after dinner. The prospect of doing something in the dark, when the sun is tucked far away and temperatures are more bearable was thrilling. And it was a delightfully comfortable, well-executed event. Once weekly during the summer, Coop Culture guides a tour in English and in Italian for those who have reserved a spot ahead of time. The tour winds through the foro on an elevated walkway with seating at various pause points where projectors display images on the sides of the ruins in sync with the audio coming through the headphones everyone wears. Cost is €16 per person, including the audio. A bargain if you ask me, as it was (surprisingly) well organized, executed, started on time, and didn’t lag for too long either. Highly suggested if you go to Rome between now and October. Late Sunday I was relieved to be ‘home’ in Milan. While it lives up to its somewhat more industrial, serious Austro-Hungarian roots, this isn’t necessarily a bad thing. Compared to the rest of Italy (I just went to Venice too), Milan’s transport works well and is extremely easy (and cheap) to take advantage of. Tourists are less apparent, and the depth of untapped arts installments goes far deeper (in my opinion) than Rome. It will never have ancient frescoes like Rome or Florence, but its contemporary credentials are impressive, between the Fondazione Prada, Triennale, Hangar Bicocca, GAM, PAC, and various traveling shows. I digress—I just had this debate on Facebook with an American visiting Rome but not Milan because it’s “boring.” SMH! Nice review about Roma. It is def such a beautiful city, full of energy from Southern Italia but yet so chaotic and not very well organized. But whoever comes to the city will be able to create memories and enjoy the great food and sightseeings all around. Attending the lights show in the evening is def something new and every reader must go when in Roma!